Rebuilders Sverige AB is a modern company with almost 100 years of industry experience. Our goal is to become a leading partner in our field of business with focus on expertise and environment. All renovations are done on their own, where each individual item is performed according to a well-established control schedule. We use the highest quality of moving and fixed replacement parts to ensure that the final product is at least as high as the corresponding model. Our ambition is to always have on stock new ranges of engines, gearboxes and other products to the market's leading car brands. Remanufacturing is an international term that is shortened "ReMan. In Sweden, this is usually referred to as "exchanged", meaning that the end product is left in exchange for a factory refurbished, which in turn undergoes the same process as the buyer. This is a typical recycling process, with the main advantages being that the cost and environmental impact are significantly lower compared to newly manufactured. More information can be found under "Environment". According to figures from "APRA", Remanufacturing vs. newly created approx. 85% in raw materials, 55% in energy consumption, several million tonnes of Co2 emissions are reduced, and all this to a price reduction of 60% for the consumer in the end. Remanufacturing is a very important part of the international car and automotive industry. We believe it is vitally important with a comprehensive and high environmental awareness and constantly working on development in this area. Rebuilders range mainly consists of factory-refurbished engines, cylinder head, gearboxes, turbochargers, sprays, AC pumps, servo pumps and a number of other vital parts for passenger cars of most brands. What is not in stock, we can usually handle without long waiting times. Rebuilders also sells newly manufactured parts such as drive axles etc. Rebuilders comply with the statutory and current warranty terms and provides 12 month warranty on all exchange units unless otherwise stated. For commercial vehicles such as eg. transport vehicles and taxis, certain restrictions on warranty commitments, such as mileage etc., may override the general terms and conditions. Disclaimer of Warranty shall always be notified by telephone followed by email labeled "Warranty" together with the invoice number associated with the purchase of the relevant device to garanti@rebuilders.se along with clear photos. In each case, it is decided whether the relevant unit shall be submitted to Rebuilders Sverige AB for debugging and verification before any remuneration for externally performed work is to be paid or if the replacement part is to be obtained in full or in part at no cost to the customer. No warranties or compensation for the same are incurred in connection with repair or deeper troubleshooting which involves disassembly and troubleshooting of the device itself, without the prior written consent of Rebuilders Sverige AB. In cases where it is found that any warranty commitment is under the responsibility of Rebuilders Sverige AB, we reserve the right to rectify the same in its sole discretion. In cases where it can be found that the reason for the alleged warranty commitment is not under the responsibility of Rebuilders Sverige AB, the customer will be charged with all costs incurred for repair, spare parts, troubleshooting, shipping and any replacement part. Rebuilders cooperate with established freight companies where the choice for each individual shipment takes place with the appropriate type based on the type of shipment for the lowest possible cost to the consumer. All our shipments are carefully packaged in a manner suitable for each shipment. Most orders received before 12:00 will be sent the same day and will in most cases be delivered by the customer the following day. All our outgoing items are insured against theft and transport damage. Re-man is based on an exchange system and therefore the returned defective part must always be returned in return for Rebuilders soon but no later than 30 days. As we trust our customers and want to facilitate the routines, Rebuilders therefore does not charge a stompant in Scandinavia, but reserves the right to do so according to the applicable price list for the relevant part if it is not returned within the prescribed time. For each shipment is included a delivery slip and a stamp unit with a unique number to be indicated as a reference when the part is ready to be retuned and return shipping notes are ordered by email "return@rebuilders.se" The relevant part / unit must be packed in the same package as the part / The unit arrived along with the unique stompantset. Payment is either in advance or on invoice. We accept Visa & Mastercard, Maestro, Bank transfer, Swish and payment via BG. Payment details can be found under "contact" further down the page. We use Sweden's largest spare parts site, Bildelsbasen.se, for the supply of our products. Click the button below to get directly to our range at Bildelsbasen (opens in new window). Rebuilders has also specialized in refurbished engines for Porsche. Anyone who has experienced a motorbike of any kind regarding Porsche knows that it is usually expensive and sometimes time consuming to have a motor renovation done. Rebuilders can deliver a replacement engine to most Porsche models at very favorable prices and at short notice. Just in the case of Porsche, in many cases it is important for the customer that the car has the factory-installed original engine left so that the car meets the requirements. "Matching Numbers", which does not happen if you traditionally mount a replacement engine. We therefore also offer a unique comprehensive solution for both private customers, workshops and car dealers, where we arrange for pickup of the car with Assistancekåren or equivalent, taking care of the entire process and returning the car in the same way. For more detailed information and prices, contact us at info@rebuilders.se. Particle filter is a very important part of the process of cleaning the exhaust gas from an internal combustion engine with the intention of minimizing emissions. 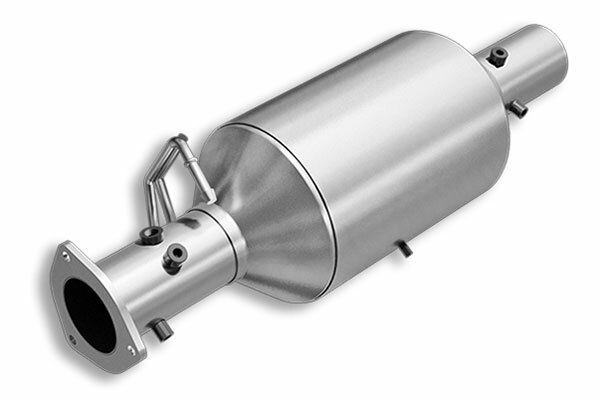 Particle files have been mounted on diesel vehicles for a long time, but in line with increasingly stringent emission regulations, many vehicle manufacturers have also begun to mount particle filters on petrol trucks. Regardless of the type of particle filter, they are replaced after a while by soot particles etc. and then need to be replaced. Rebuilders Sverige AB therefore offers a full range of "Regenerated" particle filters for both diesel and gasoline vehicles. A "Regenerated" particle filter has undergone an advanced purge process where the purge rate of the "Regenerated" final product maintains a purity of about: 99% of what a brand new particle filter fixes to generally half the cost of the consumer. Injection Spreader (Fuel Spreader) is mounted on basically all cars with internal combustion engines, regardless of gasoline or diesel. The function of a spreader is to provide exactly the right amount of fuel to the current amount of air in the fuel system. The reason for a defective "spreader" may be due to the fact that the electronic device on the "spreader" does not give the correct pressure or to drive the wrong number or fuel type (field anchorage) or simply to be clogged in after a while's run. Replacing one or more diffusers is often expensive and you often choose a used device. This may be a daring game when you do not know the condition of the same and you can easily happen for the same shortly after the action. Rebuilders Sverige AB offers a full range of most people & transport vehicles consisting of approximately 10,000 different types of refurbished "spreader" where the functional status is comparable to a factory new when all moving parts and electronic parts are replaced to new parts and the unit is tested before sales to ensure full function. Turbo aggregates are increasingly being mounted in modern automotive engines with regard to both gasoline and diesel fuel as part of the pursuit of producing smaller engines while increasing the power take-off but with the aim of minimizing fuel consumption. A brand new turbo can cost a lot while a "Remanufactured" or a sk. exchange service usually costs half. Rebuilders Sverige AB has a full range of replacement tours for most people & transport vehicles consisting of almost 30,000 item numbers in the assortment. Each turbo aggregate undergoes an advanced process where all moving and electronic parts are replaced with new ones, and each unit is tested and tested before delivery to ensure that the function is matched with a factory-new device. Rebuilders Sverige AB offers a wide range of factory-refurbished engines to the market's most common person and transport vehicles. A motorbike is very expensive to fix and it is therefore of the utmost importance that it does not happen again. A used engine is significantly cheaper than a new one while a replacement engine costs marginally more than one used, but is at the same time equated with a brand new and, in many cases, better. All of our engine renovations are made in accordance with the manufacturer's regulations and all parts we use in connection with the renovation are only original or equivalent. Our ambition is to stock the most demanded engines for immediate delivery while the non-stocked engines can generally be delivered in a relatively short period of time. Rebuilders Sverige AB also offers an assortment of refurbished gearboxes for person and transport vehicles. It is usually a very expensive measure to change the gearbox and a factory brand is significantly more expensive than one used while a refurbished gearbox is not much more expensive than one used, but at the same time you are sure that the purchase is equivalent to switching to a factory brand. Our ambition is to stock the most demanded gearboxes for immediate delivery while the gearboxes that are not in stock for immediate delivery we can usually handle in a relatively short period of time. Rebuilders Sverige AB offers a very large range of new drive axles to basically all persons & trucks. All of our drive shafts are of the highest quality and thus equated with an original factory brand, however, at a significantly lower price. In cases where drive axles require a sk. stick shaft, these are always included in our price and therefore do not need to be purchased separately as in many cases otherwise. As a rule, we can always deliver all of the drive shafts the next weekday. Rebuilders Sverige AB, in addition to the aforementioned products, also offers AC Pumps, Servo Pumps, Fuel Pumps, Steering Servo, Steering Gears, Cardan Shafts, Generators, Starters and Distribution Boxes. Do not you find what you are looking for? Contact us and we will do our utmost to meet your wishes. You can find our contact details further down the page. Rebuilders employees have deep and profound knowledge with many years of industry experience and are always available by phone or mail to give our customers the best and most efficient service. Our motto is that everything should be possible.